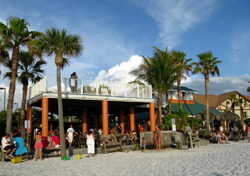 The Undertow Beach Bar on St Pete Beach has good food, cold beer, and waitresses in bikini's. A great start to St Pete Beach nightlife. We went there on a Saturday evening before going to a movie at the historic Beach Theater . It was crowded with customers mostly in the 25-32 age group. The reggae music was loud...real loud, but that didn't seem to bother any of the younger crowd. They just talked over it. After all, it is a St Pete Beach Bar ...right? It was obvious that the Undertow Beach Bar parking situation is less than satisfactory. We saw a vacant field across Gulf Blvd from the bar with about 20 vehicles parked haphazardly, but never found out if that was for overflow parking. A parking ticket would not be the way to start an evening of exploring the St Pete Beach nightlife. The Municipal Public Beach Access for St Pete Beach is about a mile to the north, but that lot closes at dark. Note: If you plan on coming to the the Undertow be smart and get there early. We just happened to get lucky. What's the attraction of the Undertow Beach Bar? The main attraction here, the one that draws so many male patrons, is the novelty of good-looking, athletic young waitresses in bikini's. The ladies, however, do not circulate and take your order. There are two enclosed bars bracketing the outside patio area. You have to figure it out for yourself to go into the one on the north side to order . The night we were there, it was clear that the staff was totally overwhelmed. There were too few waitresses available to take orders from the crush of people crammed in the little building. However, the ones who were there showed a lot patience with drunk customers attempting to order. One waitress told me the regular weekday evenings were not near as crowded, unless it was a holiday. The food is very reasonably priced and tasted good. A big plus on the menu is the free toppings you can put on your sandwich or burger. They range from tomatoes to sprouts. Potato chips are free, also. We paid for one of their specialties, "Cajun Fries." They were good, but seasoned pretty spicy. Make sure you are long on cold beer. This is a high-energy Florida beach bar. People were coming in from the beach all the time. Families with younger children were in attendance, as well as a few retired couples. Like I said previously, The Undertow caters mostly to the under-40 crowd. Although the dress is real casual, what surprised us was the large amount of young women wearing dresses there. 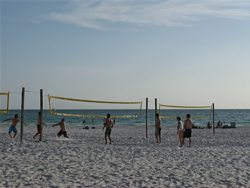 Also out back were a couple of beach volleyball courts with games going on. Players wandered in and out for a cold drink and spectators conversed easily in the cool evening breeze. This is definitely living the Florida beach lifestyle here on St Pete Beach. The play was spirited with lots of laughing, but the players were good athletes who didn't seem phased about diving into the sand. 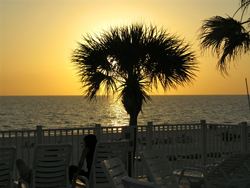 The upstairs deck at the Undertow Beach Bar is like a completely different planet. 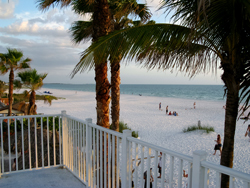 There were only two other couples up there to enjoy a quiet drink and the great view of beautiful St Pete Beach. The younger crowd was content to stay on the patio, play volleyball or the Hook the Ring game out back. A Florida beach takes on a whole different atmosphere as the sunset approaches. It is nice to watch the calming changes from upstairs. This upstairs deck is perfect for watching a Florida beach sunset. Couples talked quietly and seemed happy to to be with each other and enjoy the peacefulness 10 feet above the energy down in the bar area. 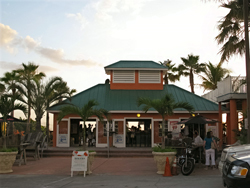 Although the bar is open until 2:00am, many people were leaving after sunset. One of the waitresses told me, though, that a new crowd arrives about 9:30pm and will party until closing. There are different drink specials after sunset, so this is one more attraction of this little place. The Undertow Beach Bar opens at 8:00am for breakfast. The outside seating seems like a nice way to open the morning after a run on St Pete Beach.